﻿ Infostroyer® 151 | Applied Magnetics Laboratory, Inc. If you need to destroy High Security Optical Media or classified information on CD’s, DVD’s or Blu-ray the InfoStroyer 151 is the lowest priced Optical Media Destroyer (CD Shredder – DVD Shredder) available. 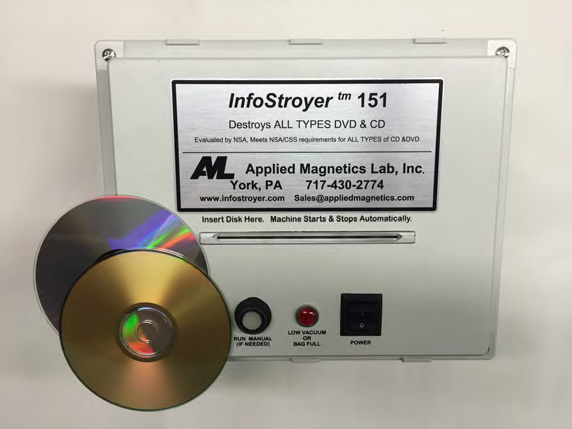 The InfoStroyer 151 creates the smallest waste particle of any known technology for CD destruction, Blu-Ray destruction and DVD destruction. AML offers a range of optical media shredders and grinders that are deployable, small, fast and economical. These optical media destruction solutions available on GSA contract. Link to NSA's Nov 2018 Evaluated Products List (EPL) for Optical Media. 110-130 VAC 50-60 Hz, 10 Amp Supply Recommended.